Charlie, an 11-year-old golden retriever is blind in both eye but that doesn't make the dog sit in a corner all day. 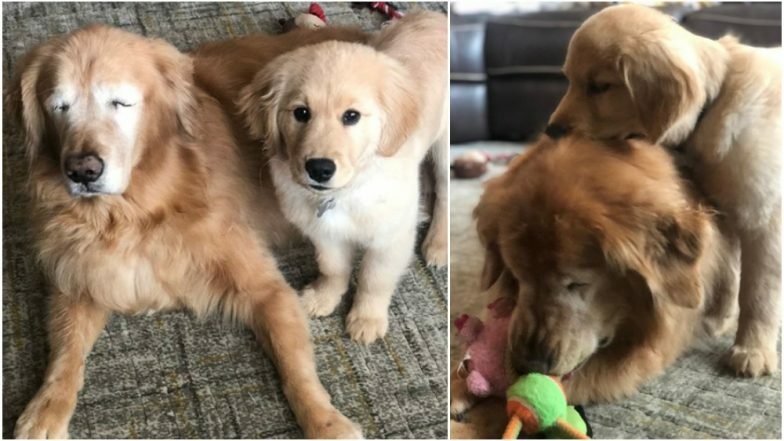 A four-month-old puppy is being the older one's Seeing Eye dog and takes him wherever he wants. The duo with a wide age gap gets along pretty well and has become each other's support system. Charlie's owners Adam and Chelsea Stipe had to remove his left eye in 2016 as he was suffering from glaucoma. A year later, his other eye also had to be removed leaving him completely blind. Seeing Eye dog is a guide dog which is trained to lead blind people, in this case, a dog. While Charlie was still adjusting to doing things without an eye, a four-month-old puppy came along. Today, Maverick and Charlie are together through thick and thin and with the former being the latter's guide. Charlie lives with his owners in North Carolina who got him home in January. Golden Labrador Adopts Nine Orphaned Ducklings; Twitter is Flooded with Pictures of the Cutest Bond! Initially, the dog and puppy did not get back, but now they are quite close. And Charlie depends on Maverick on everything from eating, playing, walking. The pup even helps Charlie in using a pillow. After the dog parents set up a dog for the duo on Instagram their friendship is now quite famous. Pictures of the dogs had gone viral with people exclaiming how adorable they looked together. Watch Funny Videos of Cute Puppies to Brighten Up Your Weekend. And they play together too! Glaucoma is an eye disease in which damage to the optic nerve causes blindness. When Chelsea she was pregnant, she got a puppy as she wanted their child to grow up with a dog. Chelsea said, "When Maverick and Charlie play, it’s definitely great to watch because Charlie turns into such a puppy. It's sweet to see them get along and enjoy each other. When they would play, Maverick would realise that Charlie would lose the toy sometimes, so (Maverick) would pick it up and put it back in front of him to re-engage playtime."